When it comes to running a multi-user dungeon, having to enforce rules is the worst. It’s a game, and most people are there to have fun, but from time to time every game encounters cheaters, trolls, and rule breakers. While banning these toxic users can seem like the easiest solution, sometimes no-tolerance policies can serve to keep well-meaning players from ever returning. One of the better ways to enforce rules within a game without driving players away is to turn it into an in-game mechanism. For minor offenses, adding an element of role play to your punishments can help build rapport with players, and even give them fuel for building a more dynamic character background. With that thought in mind, I’ve put together a few creative ways to enforce rules within your game that don’t completely alienate newer players, or sour the experience for more experienced ones. Ah, the infamous “hell ban”. While this feature is commonly found in forums and other online communities, MUDs have historically taken a more… literal approach to hell banning. For example, rather than simply silencing a user, many Diku MUD derivatives have a literal Hell that troublemakers can be sent to. The basic principle of Diku MUD Hell was effectively the same as any other implementation of hell banning — they were unable to communicate with the rest of the community — but with the added ability to role play both the punishment, and redemption of a helled player. While sending a problem user to Hell might be appealing, it can also be an overly harsh punishment in many circumstances. Whether the crime is swearing on public channels or cheating, curses are an excellent way to punish players with in-character consequences, while also keeping the tone of the punishment light enough to keep them around. Given the amount of spells and skills games have written, punishing players using them is a relatively trivial process. That said, here are a few more creative ideas using common features found many games. Many MUDs have fantasy language features, allowing for more immersion and complexity in gameplay. Generally speaking, every player starts the game with knowledge of both the common tongue, as well as the language of their chosen race, and is able to learn other languages as they level up. While this makes for more creative area designs, it also presents an opportunity for punishing players that… say… swear too frequently on public channels. By removing a players ability to speak and understand the common tongue, they will be unable to communicate with a majority of players and NPCs. While this doesn’t prevent them from enjoying the game, it does throw them a curve ball that can make the game itself far more challenging than before. Have you ever gotten into a fight in a dream? No matter how hard you swing, it seems like every punch you throw lands like a feather. This same concept can easily be applied to users as well. By negating or reducing their damage roll, the player will be rendered effectively useless in battle, no matter how often they hit their opponent. In fact, many games already have player-level spells and curses that can achieve this exact same thing. All that it would take to make it an effective punishment would be to increase the potency of the player-level spell. Battling enemies, a few scratches at a time. If you’d prefer not to make this curse a death sentence, drastically increasing the player’s armor class would have just about the same effect on their opponent. The resulting battle would be a pointless (and hilarious) back and forth amounting to little more than a slap fight. One of the most creative RP-oriented punishments I’ve ever seen in a game was an administrator that would switch a player’s character out with a harmless NPC. While this particular feat was performed as a party trick nearly as often as it was a punishment, it was a great way to punish a cheaters without ruining their in-game experience. 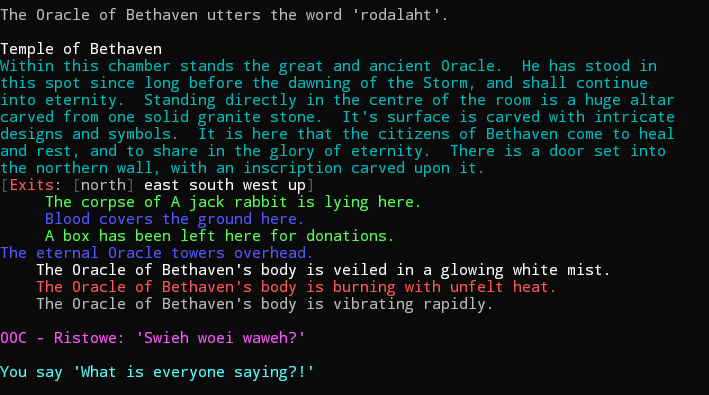 If the player becomes a rabbit… what does the rabbit become? For example, while multiplaying might be banned, some players find a way around it and share gear between their characters. By swapping one of these characters with… say… a bunny rabbit, the rules can be clearly explained, while also not driving a first-time offender away with a ban. These are just a few of potentially hundreds of ways rule breakers, cheaters, and trolls can be wrangled in-game. Have you ever built a creative enforcement mechanism or punishment? How did it work out?